What happens when a girl schemes to have her mother fall in love with the big-screen superstar who’s filming his latest project in her small town? That’s the premise of Star Falls, YTV’s latest series, debuting Friday at 7:30 p.m. ET/PT on the channel. Produced by Breakthrough Entertainment, filmed in Toronto and Port Hope, Ont., and starring a raft of Canadians in the lead roles, Star Falls is part fish out of water story, part family comedy and part The Brady Bunch. Created by George Doty IV, the adventure begins in Los Angeles when actor Craig Brooks (Dion Johnstone) informs his three children Diamond (Kamaia Fairburn), Phoenix (Jadiel Dowlin) and Bo (Marcus Cornwall) that he’s headed to a small town to film a movie over the summer … and they’re coming with him. Diamond, in particular, is not looking forward to it. Three weeks later and the Brooks family is in Star Falls where we meet Sophia (Siena Agudong) and her mother, Beth (Elena V. Wolfe). When she’s not pulling lost dogs out from under leafy porches and working at the local animal rescue, Sophia dreams of doing something nice for Beth. And, since Beth is a huge fan of Craig Brooks, Sophia figures a way for them to meet. It’s a familiar premise done in TV and other mediums, but it really works in Star Falls. I credit that to the writing—more on that below—and the on-screen chemistry between the cast. Agudong and Wolfe are totally convincing as mother and daughter and rather than go for the tired trope of having Beth be oblivious to her daughter’s life, they’re equals and connect. And, rather than pose Craig’s kids as super-annoying in order to get laughs (another gimmick), in Star Falls they’ve got good hearts and want the best for their dad, even if it does mean being outside of their comfort zone. The writing is tight in Episode 1 thanks to veteran scribes in folks like Jennifer Daley, Cole Bastedo, Laura Seaton and Meghan Read, many of whom worked with Doty on Max & Shred. The result? A truly “adorbs” series worthy of your time. Star Falls airs Fridays at 7:30 p.m. ET/PT on YTV. The Netflix version is a mix of both live-action and CGI animation, where as the original was exclusively CGI. In addition, instead of focusing on the characters in the virtual world of Mainframe, there is a focus on four, new high schoolers that find their way into that virtual world. Continue reading. Let’s talk about ReBoot: The Guardian Code. I had this big plan to write up a long essay about whether an audience can separate behind the scenes drama from a piece of art. After all, we as the audience aren’t supposed to know about any of that stuff. It was going to be awesome. I’d keep calling the show “Guardian Code” and then at the end say “Guardian Code” was perfectly average Canadian kids TV but it wasn’t ReBoot. Continue reading. When it came to finding a critic for his new series, Mysticons, creator Sean Jara didn’t have to go far. He turned to his young daughter. “She is definitely a fan,” he says with a laugh. “We started watching the animated storyboards and she’s seen every iteration of them … she’s getting a crash course in animation school.” Jara, whose resumé includes writing for Degrassi: The Next Generation, Falcon Beach, Naturally, Sadie and Johnny Test has made a splash with the high-profile animated fantasy program Mysticons, about a quartet of fierce girls who become legendary heroes and battle a dangerous foe. Airing Sundays at 11 a.m. ET/PT on YTV, Mysticons comes from Corus Entertainment’s legendary Nelvana and promotes strong, confident, smart and funny girls. The 40-episode series boasts the voices of Alyson Court as Arkayna Goodfey, Drake City’s princess who just wants to be a regular teen; Nicki Burke as Zarya Moonwolf, a street-smart gal with charm (and a pet foz named Choko); Evany Rosen as Emerald Goldenbraid, an engineer and Arkayna’s best friend; and Ana Sani as Piper Willowbrook, an optimistic street kid who is best buds with Zarya. And while Mysticons is aimed at young girls, the project didn’t originally start out that way. At its inception, the project was boy-centric to focus on a male audience. “I was hired because I’m one of the go-to people when it comes to boy’s action, but after a few years of development Nelvana saw an opportunity to develop a more girl-centric show,” Jara explains. “We talked about it, made the decision and went full-steam ahead with this new point of view.” Jara says his original idea—based on the game Dungeons & Dragons—was scrapped and he thought, “What would my daughter watch?” The result is something that became much more special and awesome. “It was about giving girls a really good adventure show,” he says. “And then we focused on the friendship between the heroes. You don’t often have that in a hero group; you usually have four or five guys and one girl.” Jara also overhauled his writing room once the gender shift happened, hiring on scribes like Shelley Scarrow, Amanda Spagnolo, Sandra Kasturi and Elise Morgan to get key insight into female friendships and break thrilling stories. There is a lot jammed into Mysticons‘ first episode. We quickly establish the futuristic world of Drake City and are introduced to our quartet of future warriors. Turns out there was once a group of Mysticons who fought evil but they’re no longer around. That’s when evil descends on Drake City in the form of Baron Dreadbane (voiced by Mac Heywood) and an army of skeletons bent on taking over. 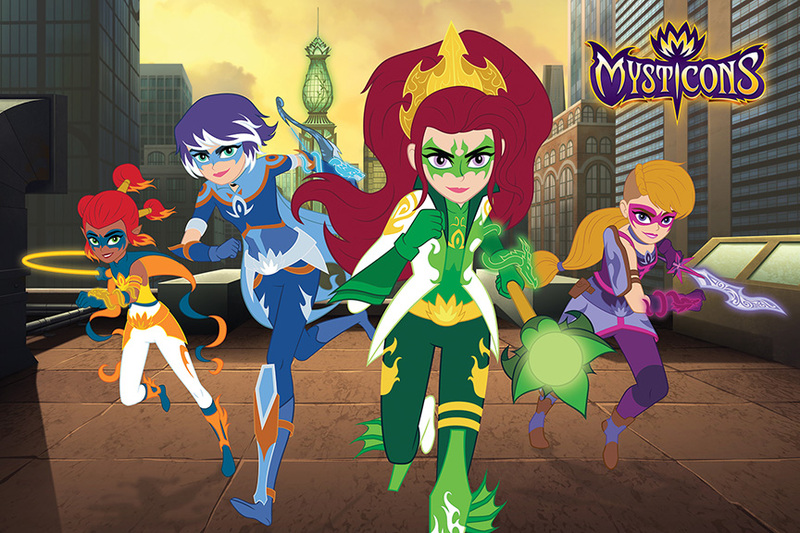 Arkayna, Zarya, Em and Piper—after getting their hands on the fabled Dragon Disk—are transformed into a new team of Mysticons who defend their fair city and its citizens. Mysticons airs Sundays at 11 a.m. ET/PT on YTV. Back in February, Ross Hull hit up social media in hopes of connecting with fans who remembered Student Bodies, the Global and YTV series he co-starred on two decades ago. He and fellow Bodies‘ compatriot Miklos Perlus were gauging interest in a Student Bodies reunion … and maybe something more. Now, months later, the plan is coming together: the cast is reuniting at in Toronto at Fan Expo this weekend to celebrate Student Bodies‘ 20th anniversary. “It’s mind-boggling to me,” Hull says of the two decades that have passed since Student Bodies debuted. “It does feel like a long time because many of us have gone in different directions and lived our lives. But, at the same time, I have vivid memories of that experience and it’s made for lifelong friendships as well.” Hull, who is the weekend meteorologist for Global Toronto, keeps in touch with many of the cast, including Perlus, who spearheaded the reunion idea. Hull says Perlus—now a writer and producer on TVO’s Hi Opie! and Opie’s Home—called on his industry contacts to put together a video (set to Green Day’s “(Good Riddance) Time of Your Life”) with Hull narrating. Word spread and now the Fan Expo reunion is happening. And, ideally, another Bodies project. 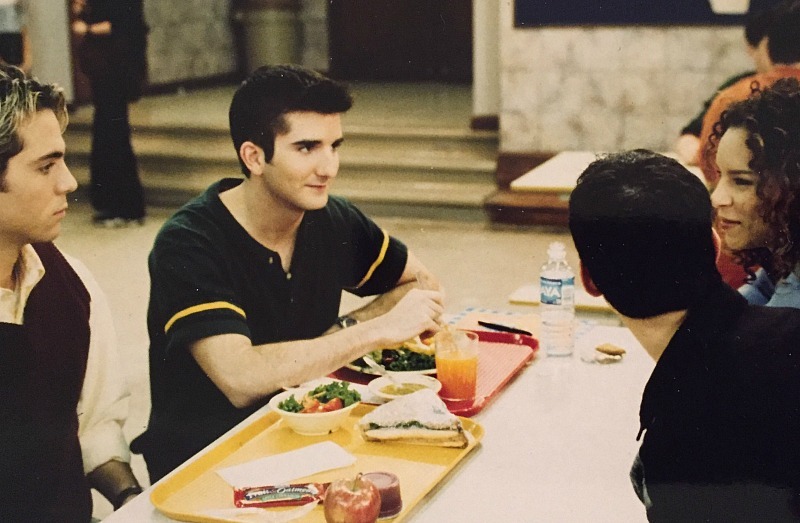 Created by Alan Silberberg, Judy Spencer and Michael Klinghoffer, Student Bodies aired on Global and YTV in Canada as it showcased the lives of students at the fictional Thomas A. Edison High School. It ran for three seasons and—aside from Hull—starred Nicole Lyn, Katie McIninch, Perlus, Jessica Goldapple, Mark Taylor, Jamie Elman, Victoria Sanchez, Dino Valiotis, Erin Simms, Jennifer Finnigan and Katheryn Winnick. The cast will reunite on stage on Saturday, Sept. 2, at 5 p.m. ET in Room 701A at Fan Expo for a Q&A, photo-op and autograph session. Confirmed cast members for the event include Hull (Chris), Elman (Cody), Lyn (Emily), Taylor (Romeo), Perlus (Viktor), McIninch (Mags), Goldapple (Flash) and Victoria Sanchez (Grace). Student Bodies has become a cultural touchstone for fans around the world and in Canada, but Hull says the program’s beginnings were anything but glamorous. The series was filmed in a decommissioned school that had been converted into studios. There was no studio audience, so the cast had to rely on the reaction of the crew to get a feel on whether jokes were landing and storylines were connecting. The trouble with that was the language barrier as most of the crew were French-speaking. So the cast tried to crack each other up. The cast of Student Bodies is celebrating its past at Fan Expo, but Hull is hopeful of a future project. There have been some preliminary talks about what that might be—Hull says bringing the characters together 20 years later or a Degrassi-type reboot are two options—but wants fans to weigh in on what they want to see. The Student Bodies reunion takes place Saturday, Sept. 2, at 5 p.m. ET in Room 701A at Fan Expo. Would you like to see a new Student Bodies project? If so, what? Are you attending the Fan Expo session? Let me know in the comments below. WOW! Unlimited Media’s Mainframe Studios and Corus Entertainment are pleased to announce that production is underway in Victoria/Vancouver, B.C. on the live-action elements of ReBoot: The Guardian Code, a 20×22 minute live-action/CG-animated hybrid television series. This next phase of production reimagines the original 1994 animated classic, ReBoot, in a real life setting for modern, tech savvy audiences. Created by Michael Hefferon, the show follows four teenagers who discover that they’ve been selected to become the Next-Generation Guardians of cyberspace. ReBoot: The Guardian Code will premiere in Canada in 2018 on YTV. After playing the multiplayer Cyber Guardians video game together, four teenagers are recruited by V.E.R.A (Hannah Vandenbygaart, Bruno & Boots: Go Jump in the Pool! ), the Virtual Evolutionary Recombinant Avatar, to fulfill their mandate to mend and defend cyberspace. Austin (Ty Wood, The Haunting in Connecticut), Tamra (Sydney Scotia, Some Assembly Required), Parker (Ajay Parikh-Friese, Mr. Young), and Trey (Gabriel Darku, Shadowhunters: The Mortal Instruments) now must protect cyberspace from threats that pose true consequences to both the virtual and real world. It’s more than these kids expected when they started at Alan Turing High. Way more. ReBoot: The Guardian Code intercuts live-action scenes with awe-inspiring CG animation produced with the Unreal game engine, showing how the real world and cyberspace are interconnected. This innovative series will also deliver true 360-degree engagement experiences for audiences with interactive mobile games, a digital trading card game that syncs with the broadcast of the series, and a Virtual Reality experience that puts fans right in the middle of the cyberspace action. More details to be announced at a later date. ReBoot: The Guardian Code is produced by Mainframe Studios in association with Corus Entertainment, with Executive Producer/Producer Michael Hefferon, Executive Producer/Showrunner Larry Raskin, and Matt Sheppo, the Production Executive for Corus.